Spring arrived with all its glory. It’s the time when the landscape wakes up and becomes green again. It is also a kick-off for special celebrations. Ah yes, wedding season. This year there is a particular one a bunch of folks are excited about. However it isn’t a real one. The movie My Big Fat Greek Wedding 2 finally happens on the big screen. How to celebrate? With food of course! 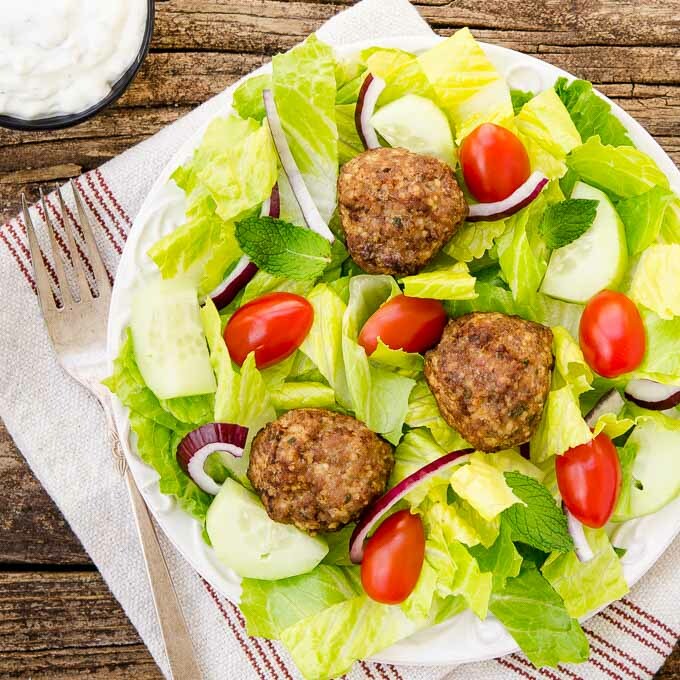 Greek Meatball Salad was inspired by the movie and what I made for a virtual celebration. Food and movies go hand in hand. I’ve said it many times before. My Big Fat Greek Wedding is a perfect example. It’s impossible for me to think about the movie without lamb, potatoes, fruit, and bundt cake coming to mind. I can’t wait to see what food is highlighted in the sequel (I haven’t seen it yet). The same is true for my fellow Sunday Supper tastemakers. It’s why we are having a virtual movie party. What to bring to the party was the question. I bake bundt cakes all the time so I passed on it. Then I thought of Toula and Ian, the main characters in the movie. Toula is a meat eater and Ian is a vegetarian. 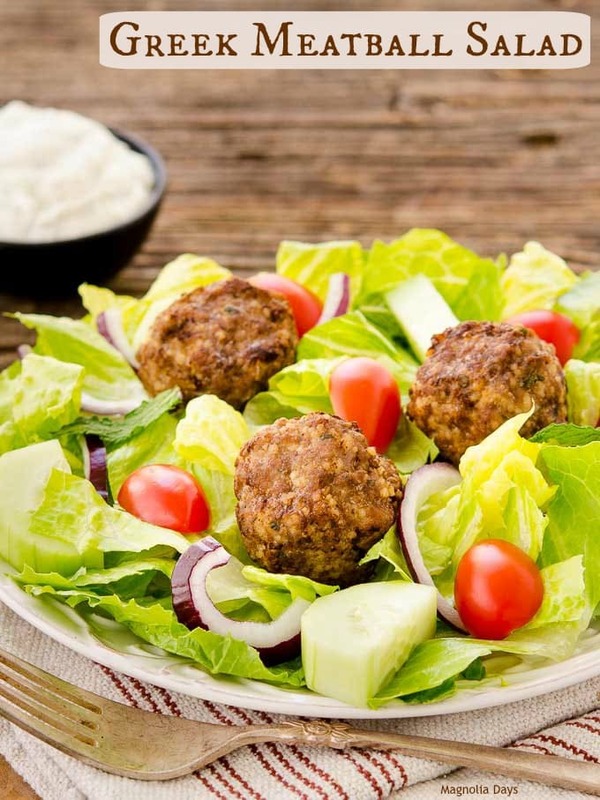 A Greek Meatball Salad represents the marriage of the two. It’s the best of both worlds combined on one plate. First there are the meatballs. They are a combination of beef and lamb. Couscous is one of the binders instead of breadcrumbs. Garlic and fresh mint both flavor and enhance the meats. The meatballs are on top of romaine lettuce along with tomatoes, onion, and cucumber. It’s dressed with Tzatziki sauce because it goes superbly with both meat and vegetables. What Greek food is your favorite? The one at the top of my list is Spanakopita. A gyro and Greek Meatball Salad are up there too. Scroll down to see what recipes are being shared for this special Sunday Supper virtual movie party. What a tasty celebration indeed! Opa! 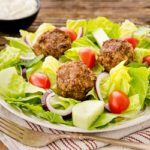 Greek Meatball Salad has beef and lamb meatballs, cucumber, onion, and tomato on romaine lettuce and dressed with tzatziki sauce. Heat oven to 350°F. Place a rack in a rimmed baking sheet. Stir together couscous, egg, mint, garlic, salt, and pepper in a large bowl. Add ground beef and lamb and mix well. Shape into 12 meatballs. Heat olive oil in a large skillet over medium heat. Brown half of the meatballs, turning to brown evenly. Transfer browned meatballs to rack on baking sheet. Repeat with remaining half of meatballs. Bake meatballs for 12 to 15 minutes, until cooked through (internal temperature registers 165°F when tested with instant-read thermometer). Divide romaine, cucumber, tomatoes, and onion equally among 4 plates. Top each with meatballs. Serve with tzatziki sauce for the dressing. Make the tzatziki sauce a day in advance or allow time for it to chill for at least 1 hour prior to making the salad. I love that you made a salad with meatballs!! This is beautiful and I’m certain delicious! Looks like a simple but filling salad! This looks great–and so fun! I love pairing movie night with foods!! Ohhhh Renee! I love that you married the two so literally like the movie. I also love that you used ground beef AND lamb – I need these meatballs in my life, for sure! This salad has it all! What a great dinner salad idea! That is the perfect marriage, Renee! What a beautiful fresh idea! I am looking forward to seeing the movie but hope it won’t disappoint. We’ve been waiting so long! A favorite Greek dish / dessert is baklava. I love tzatziki as a salad dressing! This is a great recipe. I love meatballs, but have never added lamb! I have a feeling these would hit the spot, too! And what a fun idea to serve them over salad. Perfect lighter meal! Food and movies totally go together!!! 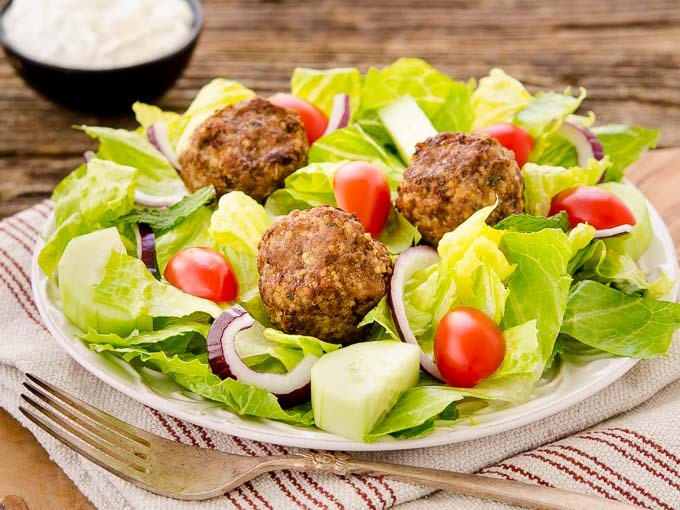 And I love this meatball salad – I’d love to have some right now! The perfect salad…it has all of my favorite things!!!! I would love this. I love gyros and this seems like a gyro salad almost.